I Love Letters! 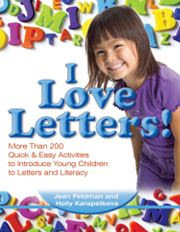 : More Than 200 Quick & Easy Activities to Introduce Young Children to Letters and Literacy by Jean Feldman and Holly Karapetkova is my latest perusal when it comes to learning how to better introduce my son (age 2 1/2) to the world of reading. He recognizes there there are such things as letters. He consistently and regularly points to words and sentences and asks to be told what they say. However, letter recognition itself seems to be a bit beyond us. I thought I'd pick up this book and see what it had to offer as to directed intruction and exposure to the alphabet. We intend to home school and this book is flat out written for the teacher in the classroom. As such, many of the ideas and activities in this book are geared towards group activities or things that might just work better if you had more than one kid that you were working with. That said, there is plenty to be gleaned from this book. You just have to know that you might need to adapt a few things to suit you and your one or two children. This book is filled with ideas on how you can familiarize your young one(s) with the alphabet in preparation for reading. There are game ideas that can be created by the adults and used by the children, as well as ideas for the children to create themselves. I think my favorite idea was the Alphabet Journal where the children are encouraged to collect items that begin and/or represent any given letter. There is a section in the book that deals specifically with oral language skills, encouraging adults to engage their children in routine speeches (i.e., rhymes, chants and affirmative words). They also encourage a strong use of pictures and images in promoting language skills. From sign language to classroom and individualized games, I Love Letters! is full of good ideas which will promote and prompt a love of reading in children. Therefore this is a book that I cannot complain about.